Who are the Women in the Book Trade? A couple of months ago I published a piece in the Guardian about my decision to start a rare book business focused on work by women, particularly women writers, and the unequal treatment of books by women in the trade. The piece received a good deal of attention, and I didn’t know if anyone would notice or pay attention, particularly outside of the rare book trade. I was careful to say that I am not the only woman who has focused on the work of women in the book trade by any means, but for the first four years of dreaming about The Second Shelf I didn’t know any myself and I wondered if I might be the first to do so. But I had only been to New York City book fairs, and very few at that. I had only talked to a few people in the trade, who encouraged my business idea and said that it would be a welcome and needed business. It was only when I moved to London and started actively learning the trade and buying stock, that I started to undertand there were many book dealers who focused on the books related to women. In the trade it’s been labeled “women’s interest,” a phrase I don’t particularly like, because women, being about half of humanity, should not be treated as a niche subject. There are wonderful dealers who made women their focus including the incredible Elizabeth Crawford, who I have only recently met and am in awe of, and Paulette Rose in New York, and I just missed meeting Chantal Bigot of the French book business Les Amazones, but we are now in touch. 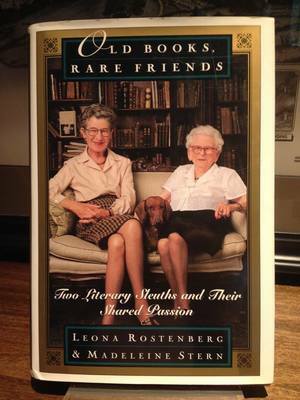 I know there are many, many more, and certainly we stand on the shoulders of those like Leona Rostenberg and Madeleine Stern, who not only sold rare books but introduced the business to a wider audience in the books they authored, including Old Books, Rare Friends and Between Boards. There are also many more women in the book trade operating as dealers than there have been in the past, although we are still a small percentage of the total. The Guardian article set in motion a lot of press, none of which I was expecting at all, and interviews from freelance writers outside of the trade. These are articles (Paris Review, Lit Hub) pitched to literary readers who might not know the rare book world at all, and these pieces are drawing attention to the lack of representation in the book trade, and how women are the minority and underrepresented in owning book businesses and leading book firms. This is all true, but what the pieces didn’t set out to do is champion all the scores of women who do run book businesses, leaving the few women interviewed in the pieces seeming more exceptional than we are. Women in rare books are still somewhat rare and they are tremendous - their achievements are still not well known inside or outside the trade. I am quite new to the trade and heard little of women’s history in the field until I wrote my Guardian article. This actually only suggests to me how very separate we bookwomen have been treated, as we don’t have a pronounced place in the oral history of the trade--a trade of bookmen. It’s a great time to learn who our foremothers were, and who the tremendous women are standing next to us. I had mentioned several women in the trade to journalists, and some of their names got cut repeatedly, which is a frustration, but it gives me the opportunity to thank one bookwoman here. In addition to Heather O’Donnell of Honey and Wax, who first introduced me to the trade, I don’t think I would have started this business without the encouragement of Deborah Davis of Love Rare Books. When I moved to England, I didn’t know many people (still don’t know too many people), and she was the person who made the most difference upon arrival and actively encouraged me to try and set up a stand at the monthly Bloomsbury fair. I’m not sure I would have ever been brave enough to show up by myself without knowing anyone or being able to ask advice. She was willing to answer my questions and willing to tell me what I was doing right and wrong. Her encouragement was significant--she was inviting and open at a time when I was struggling to settle in and figure out what I was going to do with this business, or if I was going to do it at all. She also has impeccable taste in books. I would fail miserably if I were to try to mention every woman in rare books who has made a difference to me or inspired me in the short time I’ve been in the trade, and the history of women in the book trade is still quite obscure to me. I am learning fast, but I don’t have the background or ties to trade organizations and their histories yet. Luckily, bookdealer Deborah Coltham gave a talk at the ABA fair this year Battersea in May about the history of women in the trade and has published it on her website. It is a wonderful starting place for us all. I’m inspired by all of these women. We are all changing the book trade for the better. A couple of months ago I published a piece in the Guardian about my decision to start a rare book business focused on work by women, particularly women writers, and the unequal treatment of books by women in the trade. The piece received a good deal of attention, and I didn't know if anyone would notice or pay attention, particularly outside of the rare book trade. I was careful to say that I am not the only woman who has focused on the work of women in the book trade by any means, but for the first four years of dreaming about The Second Shelf I didn't know any myself and I wondered if I might be the first to do so. But I had only been to New York City book fairs, and very few at that. I had only talked to a few people in the trade, who encouraged my business idea and said that it would be a welcome and needed business. It was only when I moved to London and started actively learning the trade and buying stock, that I started to undertand there were many book dealers who focused on the books related to women. In the trade it's been labeled "women's interest," a phrase I don't particularly like, because women, being about half of humanity, should not be treated as a niche subject. There are also many more women in the book trade operating as dealers than there have been in the past, although we are still a small percentage of the total. The Guardian article set in motion a lot of press, none of which I was expecting at all, and interviews from freelance writers outside of the trade. These are articles (Paris Review, Lit Hub) pitched to literary readers who might not know the rare book world at all, and these pieces are drawing attention to the lack of representation in the book trade, and how women are the minority and underrepresented in owning book businesses and leading book firms. This is all true, but what the pieces didn't set out to do is champion all the scores of women who do run book businesses, leaving the few women interviewed in the pieces seeming more exceptional than we are. Women in rare books are still somewhat rare and they are tremendous - their achievements are still not well known inside or outside the trade. I am quite new to the trade and heard little of women's history in the field until I wrote my Guardian article. This actually only suggests to me how very separate we bookwomen have been treated, as we don't have a pronounced place in the oral history of the trade--a trade of bookmen. It's a great time to learn who our foremothers were, and who the tremendous women are standing next to us. I had mentioned several women in the trade to journalists, and some of their names got cut repeatedly, which is a frustration, but it gives me the opportunity to thank one bookwoman here. In addition to Heather O'Donnell of Honey and Wax, who first introduced me to the trade, I don't think I would have started this business without the encouragement of Deborah Davis of Love Rare Books. When I moved to England, I didn't know many people (still don't know too many people), and she was the person who made the most difference upon arrival and actively encouraged me to try and set up a stand at the monthly Bloomsbury fair. I'm not sure I would have ever been brave enough to show up by myself without knowing anyone or being able to ask advice. She was willing to answer my questions and willing to tell me what I was doing right and wrong. Her encouragement was significant--she was inviting and open at a time when I was struggling to settle in and figure out what I was going to do with this business, or if I was going to do it at all. She also has impeccable taste in books. I would fail miserably if I were to try to mention every woman in rare books who has made a difference to me or inspired me in the short time I've been in the trade, and the history of women in the book trade is still quite obscure to me. I am learning fast, but I don't have the background or ties to trade organizations and their histories yet. Luckily, bookdealer Deborah Coltham gave a talk at the ABA fair this year Battersea in May about the history of women in the trade and has published it on her website. It is a wonderful starting place for us all. I'm inspired by all of these women. We are all changing the book trade for the better.